The history of chess dates back 1500 years, but it wasn't until the introduction of competitive chess in 1834 that the rules were solidified. Since that time, players of all calibers have diligently worked to find new and better ways of winning. During the Romantic Era, gameplay was characterised by daring attacks, tricks, surprises, and clever combinations and sacrifices. As noted by David Shenk in The Immortal Game: A History of Chess, style was more important than winning. But in an era when chess was still not very well understood — it is a game that features trillions upon trillions of possibilities after all — players didn't know any better. The Romantic style of chess also fit in very nicely with the general weltanschauungen of the time. But this sensibility would change after the First World War. During the 1920s and 1930s, players adopted more scientific and logical approaches to chess, including hypermodernism — a strategy that, similar to the evolving tactics of WWI, required players to question conventional approaches. And this, in turn, changed how players opened the game. They still agreed it was vital to control the center of the board, but they insisted this could be accomplished in ways other than moving the King's or Queen's pawn forward. "Do not create a pawn center that can only be attacked," explains Julia Becerra from Chess.com. "The New Idea in chess postulated that the important thing was the solidity of the center rather than its extent." [R]egular but moderate physical exercise; analysing very thoroughly a relatively narrow repertoire of openings; annotating one's own games, those of past great players and those of competitors; publishing one's annotations so that others can point out any errors; studying strong opponents to discover their strengths and weaknesses; ruthless objectivity about one's own strengths and weaknesses. Other chess styles followed in the wake of Russian Dynamism, including the super-disciplined and end-game-grinding concrete approach. Today, no particular style dominates. 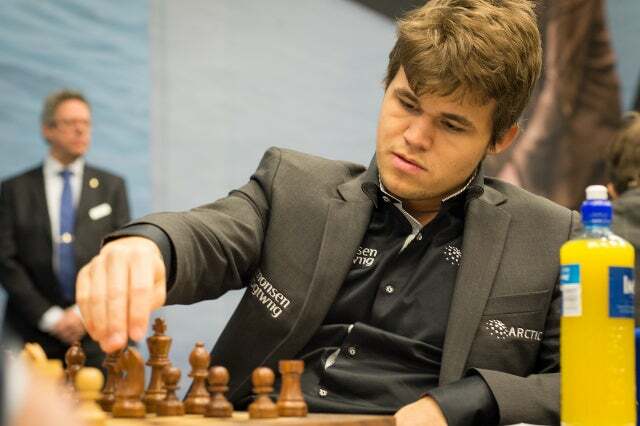 According to Grandmaster Garry Kasparov, "the elite chess players of today are of no school," adding that chess wunderkind Magnus Carlsen could usher in a new era. That said, Grandmaster Viswanathan Anand says that Carlsen's approach best resembles that of a computer. For example, most human players appear to have an issue with moving pieces back to a prior position — but not Carlsen. There's no understating the degree to which computers have revolutionised the game of chess. Following Kasparov's defeat at the hand's of IBM's Deep Blue in 1997, computers have consistently defeated the best human chess players. Today, regular laptops can run dominant chess engines like Houdini and HIARCS. In his essay, "How Computers Changed Chess," Guillermo Campitelli of Edith Cowan University describes three different ways computers have irrevocably changed the game. 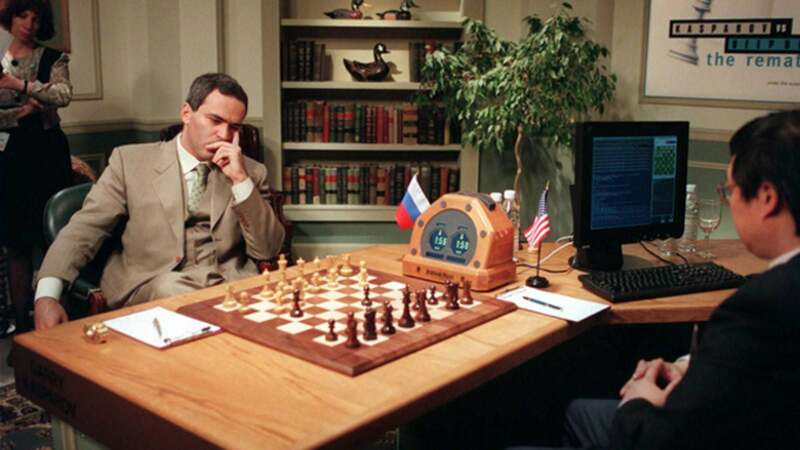 First, it has made human gameplay secondary in some senses — during competitions, commentators defer to computers to learn which next move is a player's best. Mistakes are almost immediately recognised. Second, it has resulted in cheating. Some say it's at epidemic proportions. Back in 2013, for example, Bulgarian player Borislav Ivanov performed ridiculously above his Elo, prompting allegations of cheating. Though it was never proven, he was accused of hiding a device under his shirt and inside his shoes. To prevent cheating, some tournaments require players to walk through a metal detector. Lastly, computers have changed the way players prepare for tournaments. Players can now base their openings on databases containing millions of games. What's more, they can exhaustively test their openings by feeding their tactics into a chess engine. This can help them discover "novelties," i.e. amazing new moves that have eluded every previous player, including grandmasters. The first several moves in chess are among the most critical. As many as 400 unique positions are possible after each player's first move, which then jumps to an astounding 197,742 positions after each player's second turn. But because the vast majority of these positions are strategically precarious, only a few hundred are considered viable. And of these, only a precious few are regularly put into play. 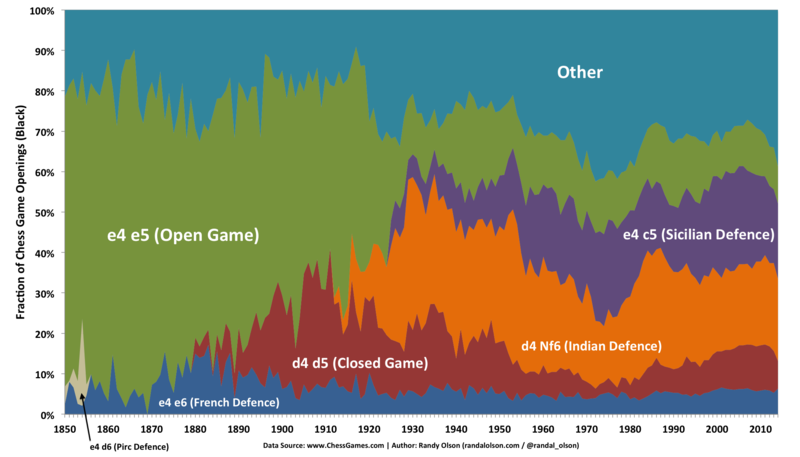 To get a visual sense of how the popularity of chess openings have changed over time, computer science graduate assistant Randal Olson from Michigan State University explored a dataset of 65,000 chess tournament games dating back to 1850. His resulting visualisations paint a picture of modest refinement with a hefty dose of conservatism. White's classic opening move of King's Pawn to e4 dominated up until the 1920s (i.e. the advent of the hypermodern era), but it remains a staple first move to this day; the strategy of directly working to control the center has never really fallen out out style. Only three other opening moves have emerged as credible options, namely Queen's Pawn (Pawn to d4), the Zukertort Opening (Knight to f3), and the English Opening (Pawn to c4). In 1850, it was standard fare for Black to match the ever-popular King's Pawn by moving a Pawn to e5 (the Open Game). ...the rise of the Queen's Pawn in the 1890s resulted in the rise of the Closed Game [d4 d5] in the 1890s. Black openings similarly saw a burst of innovation in the 1920s, with the development of the Indian Defence in response to the Queen's Pawn, and the introduction of the ever-popular Sicilian Defence [e4 c5] in response to the standard King's Pawn. By 2014, the Open Game [e4 e5] is well past its glory days, and seems to be on its way out. The French Defence [e4 e6] seems to have been a staple Black opening for the past 164 years, consistently comprising 5%-10% of all chess games. Amusingly, the French Defence has a reputation for solidity and resilience, which is also reflected in its historical usage. Looking at the graph of Black's opening moves, the rather sizeable "other" portion shows that Black is more willing to start with less conventional moves than White. After the first move, things get considerably more diverse in terms of the options available. 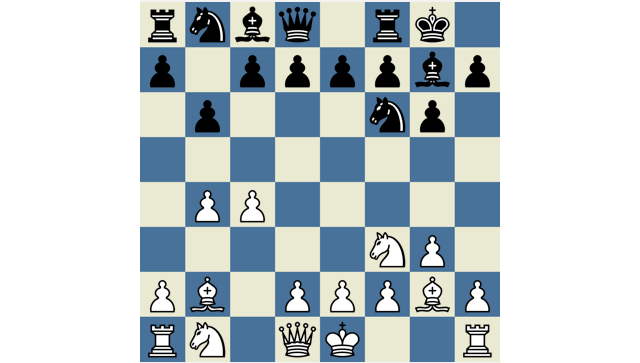 White used to prefer King's Knight (1. e4 e5 2. Nf3) by a wide margin, but there are now a half-dozen conventional counters to Black's e5, including the Indian Defence (1. d4 NF6 2. c4) and Open Sicilian (1. e4 c5 2. Nf3). As for Black's second move, Olsen produced this video instead of a visualisation, owing to the plethora of options. I think the recent trend is away from openings. In a sense, computers have killed the opening phase. There is only so much that you can do. So if anything can be done, it is to rebalance the game. That can only happen by concentrating on the middle and end game. Indeed, players can now study the opening phase of the game to a ridiculous degree, rendering the first set of moves largely meaningless. For all intents-and-purposes, the game doesn't really get started for tournament players until things get considerably "off book." One thing that hasn't changed over the years is White's advantage. In fact, as a 2013 study by an international team of researchers pointed out, White's advantage has steadily increased over time. The reason for this, say the researchers, is that players are consistently finding better ways of taking advantage of the first move. By analysing 73,444 high level chess matches spanning over 150 years, the researchers discovered that the current average advantage of being White is around 0.17 pawns. This value is exponentially approaching a value of 0.23 pawns, which should be attained in about 67 years. Once it gets to that point, the researchers expect the game to reach a maximal steady-state; eventually, players will no longer be able to discover new ways of exploiting White's first move advantage. 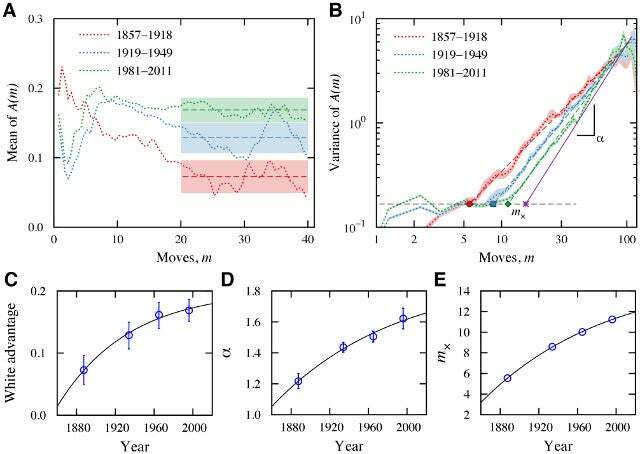 The same study also showed that the opening stage of a match is increasing in length; it will get to about 15.6 moves within a timescale of 130 years. Randall Olsen's work has also found that draws are now much more common. "Only 1 in 10 games ended in a draw in 1850, whereas 1 in 3 games ended in a draw in 2013," writes Olsen. "The small dip in draws since 1980 looks promising, but it could very well just be noise." Many of these trends can be attributed to the steady influx of superior players, the adoption of defensive game play, and increasing parity among high level players. Analysis by H. V. Ribeiro et al. (the same team that studied White's advantage), shows that Grandmasters are not only increasing in number, they're also getting younger. As the researchers point out in their study, the stability of chess since the 19th century "increased the game popularity and enabled players to work toward improving their skill. 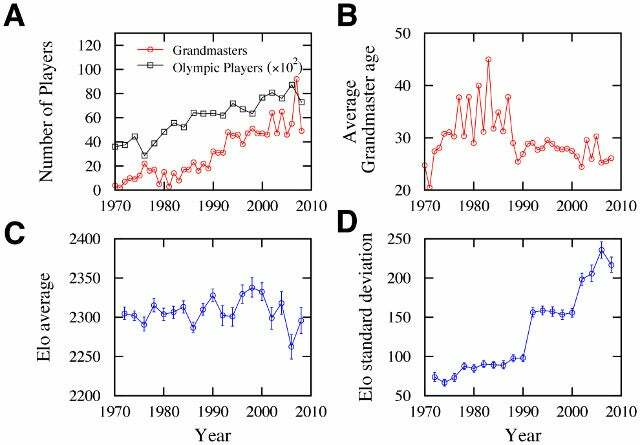 A consequence of these efforts is the increasing number of Grandmasters — the highest title that a player can attain — and the decreasing average player's age for receiving this honour."